This is the new Plus version of the IRX4 Multiprotocol Module. 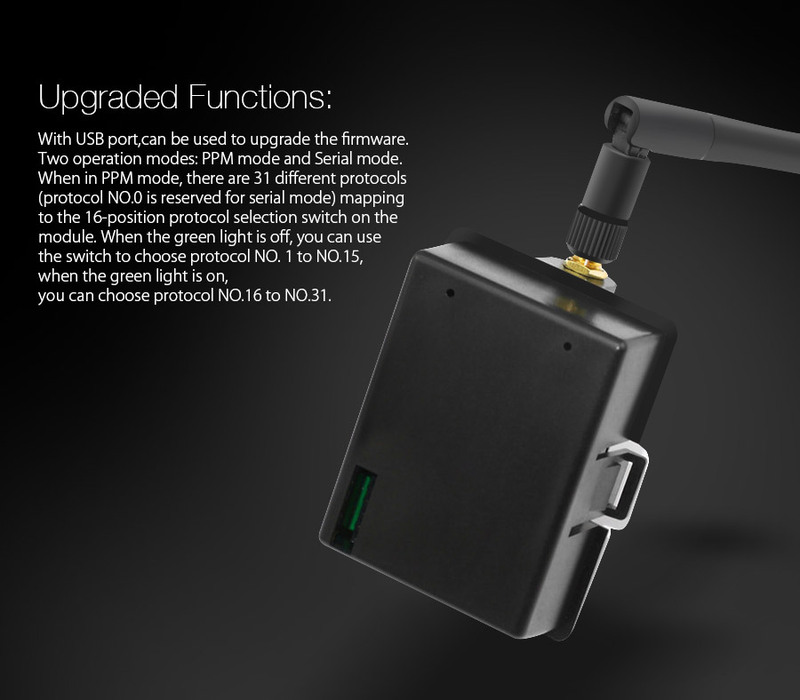 New features includes a manual protocol selection dial for transmitters which don't support for OpenTX firmware, a USB port for updates and finally a redesigned casing which is a much better fit in JR module bays. If you have been in this hobby for a while, you will likely have amassed quite a collection of RC models and not necessarily all of them bound to the same radio control, so probably a collection of them too. That's where this multiprotocol TX module will come in handy. 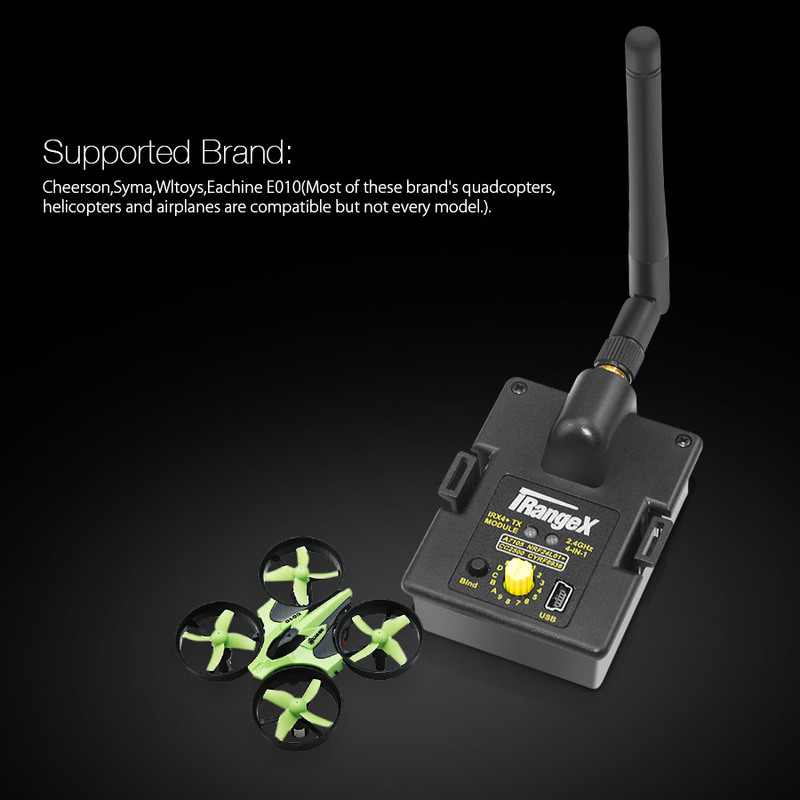 It incorporates four RF chips into one transmitter module and supports pretty much all of the communication protocols used in the RC hobby so that you can control everything from a single radio; from toy grade Syma models to FrSky racing drones or Spektrum BNF aircraft. 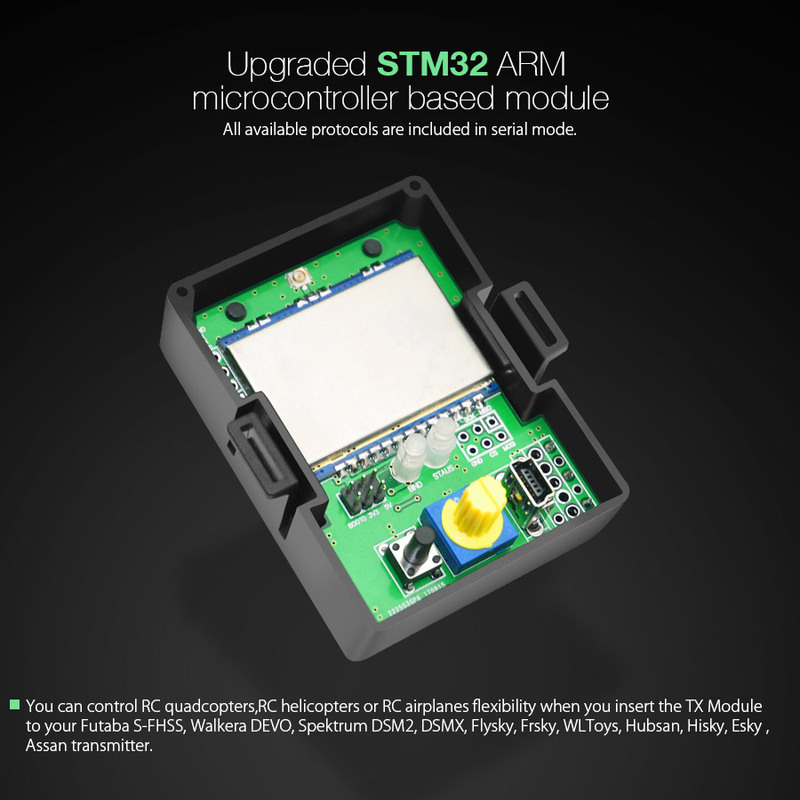 The Module features a STEM32 microcontroller (MCU), which has enough on-board storage space to store all of the protocols you need without having to re-flash it. 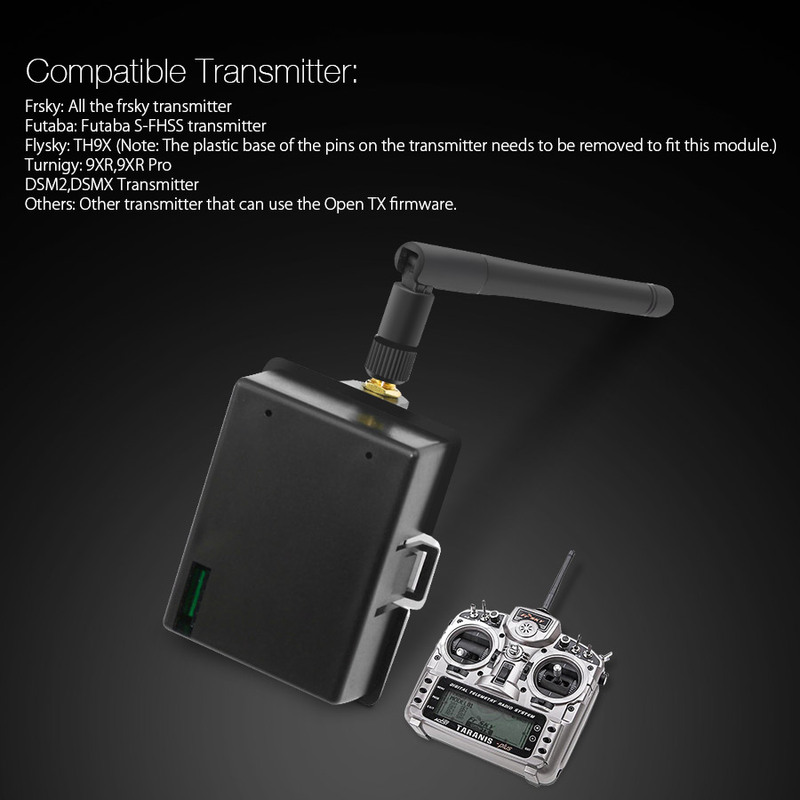 The operation mode can be used by transmitters that operate with OpenTX 2.2.X, so all FrSky transmitters and other brands too. 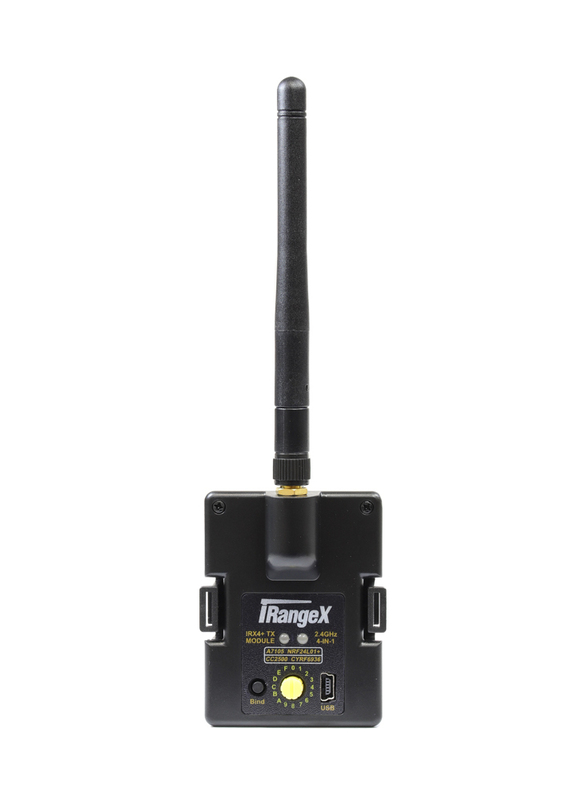 OpenTX 2.2.X has special support for the iRangeX IRX4 Plus that allows the protocols to be easily selected from the transmitter SETUP menu or Companion. Serial mode is selected by placing the rotary switch to position 0 before powering on the radio. This operation mode is for transmitters that don't support OpenTx firmware. According to the default PPM protocols table, turn the rotary protocol switch to the indicated number to choose the appropriate protocol. When in PPM mode, there are 31 different protocols (Position '0' is reserved for serial mode) mapping to the 16-position protocol selection switch. When the green LED is off, you can use the switch to choose Protocol Number 1 to Number 15. When the green LED is on, you can choose Protocol Number 16 to Number 31. To turn on/off the green LED - turn of the transmitter, point the protocol switch to '0', hold and press the bind button and then turn on your transmitter, after 3 seconds release the button. Power on your receiver and set it to binding mode. 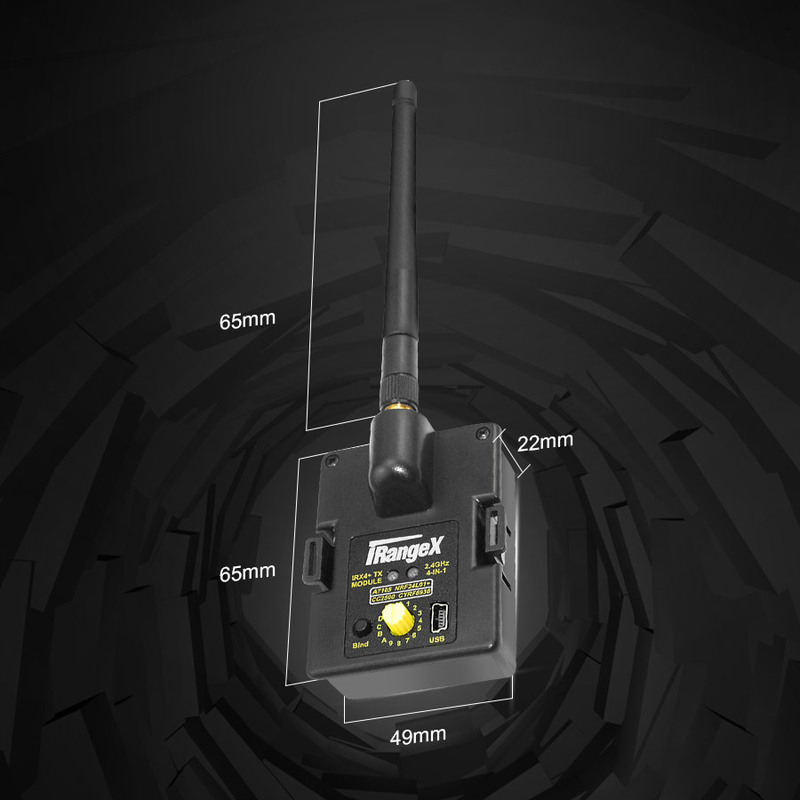 Hold and press the bind button of the Multiprotocol Module and then turn on your transmitter. After 3 seconds release the button, you will see the red light flashing rapidly, the module is in binding mode and the red light will go solid after binding. Some protocols (eg: S-FHSS) don’t have binding procedure on RF module, and some protocols (eg: hubsan, e010) will auto bind when power up. The red light will blink slowly if there is no valid PPM signal. Sometimes, you may need a power recycle when you choose a new protocol. for example, protocol changes from Q303 to HISKY. For FRSKY and S-FHSS protocol, you may need to set the value of Fine or Option (in the Model Settings menu) properly to bind with your model.